The Thermal Rainbow gives a succinct, visual representation of the Blue Grand Canyon’s™ influence on the temperatures and subsequent varietal selection throughout Monterey Wine Country. The coolest districts are to the north, closest to the ocean and the warmest areas are to the south of the county, furthest from the ocean. In the early morning, the entire region is cool and, for a large part, covered by a thick marine layer. Temperatures at Monterey Bay in the north and the southern end of the county are both around 55 degrees. As the sun rises, the valley starts to warm. The heat burns off the fog and begins the slow rise in temperature at the southern end of the county. The heat generated from the sun forces the warm air to rise and creates a low pressure effect. Cool air off the ocean is drawn and funneled through the Gabilan and Santa Lucia mountain ranges, moving down the valley with increasing force as the day progresses. The ocean air acts as a natural air conditioning system that mitigates the rise in temperature from north to south and extends the growing season, allowing for slow, gentle ripening. At their peak, wind speeds approach 30 miles per hour and there is a 40 degree differential from the Bay to the south end of the county. Where a vineyard is located within this Thermal Rainbow goes a long way to determining which of the region’s forty-two varietals are planted there. 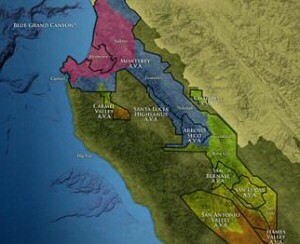 Cool climate-loving Pinot Noir and Chardonnay do well in the north; Cabernet Sauvignon, Zinfandel and many Rhone grape types flourish in the warmer south.